As the writers of this article we spent the majority of our lives in New Jersey before relocating to Tennessee in late 2015. Being lifelong residents of the Garden State it was almost mandatory compulsory behavior to be a fan of its famous favorite son, Bruce Springsteen – and we were. But, our fascination with the man centered mainly around his interest in helping with the revitalization and restoration of the shore town that put him on the map in the first place – Asbury Park. 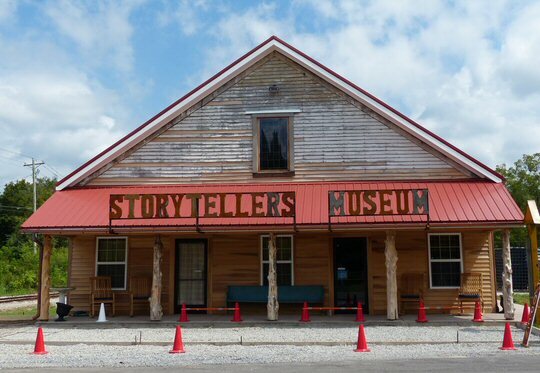 The recently renovated Storytellers Museum in Bon Aqua, Tennessee. Since 1999, Springsteen has actively encouraged fans from around the world to visit and spend cash in the town popularized by the gritty DeNiro film, “City by the Sea”. In 2002, Bruce released his comeback album called The Rising along with a song dedicated to Asbury Park called “My City of Ruins”. Against long odds the spotlight that was shone on the town by The Boss helped transform his once forlorn but beloved shore town into the hip tourist attraction that is has become today. Bruce is one of just a handful of recording acts whose roots are so closely identified with a particular geographic region. Consider how the Beatles have Liverpool, Elvis – Memphis, the Grateful Dead – San Francisco, Dave Matthews – Charlottesville, Prince – Minneapolis. These artists made such an impression on the locales that birthed or fostered their careers that real economic impact is still felt on the ground today as fans flock to the meccas of their musical idols. Sally and Brian Oxley and their rugged old cross. In much the same way Middle Tennessee is central to the story of the legendary Johnny Cash who put down roots from Hendersonville to Nashville. Lesser known is that J.R. owned a farm west of Music City in the small town of Bon Aqua. 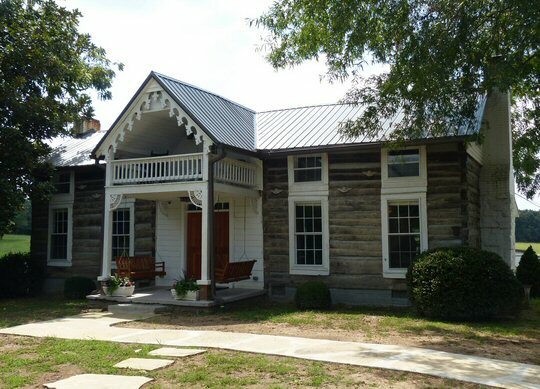 Recently, this homestead and other properties associated with the Man in Black have been acquired and restored that will no doubt help the rural region in Hickman County rise to new heights on the long coat-tails of its one-time resident. At the corner of Old Highway 46 in Bon Aqua, Tennessee is The Storytellers Museum. The former general store has a long history, most notable in the 1970’s it was converted by Johnny Cash to be the spot where the “Saturday Night at Hickman County” guitar pulls took place on the “Little Stage”. Later Johnny sold it to Red Wortham who turned it into a recording studio. In 2016, the structure was on the verge of collapse when Brian and Sally Oxley purchased the building. Within months the couple along with supporters including Johnny’s daughter Cindy Cash had resurrected it to look like an old time general store on the outside. Inside it is The Storytellers Museum. The Oxleys themselves have become somewhat curious collectors of Cash memorabilia from cars to real estate in a relatively short period of time. Their lightning fast acquisitions began only three and a half years ago when Brian learned of Johnny and his music for the first time. Mr. Oxley observed a portrait of an elder Cash on his business partner’s wall, became intrigued – and the rest as they say – is history. 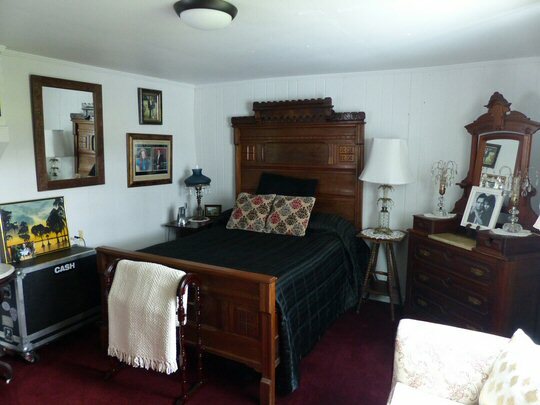 Johnny Cash’s bedroom at his beloved Bon Aqua farm. The rooms at the museum are paneled in warm, wood tones for good acoustics. The “Little Stage” has been restored. Acoustic guitars and other instruments are set up ready to be played. A pair of large boots take their rightful place at the front of the “Little Stage”. The majority of the displays are dedicated to The Man in Black. Items of particular interest include Johnny’s guitars, the original handwritten lyrics to “Saturday Night in Hickman County” and the “One Piece at a Time Car” made famous by the classic Cash song. There are rows of yellow chairs in the room that once belonged to country comedian Minnie Pearl. The Museum also has a number of rare 16th century Bibles and a page from the Gutenberg Bible. 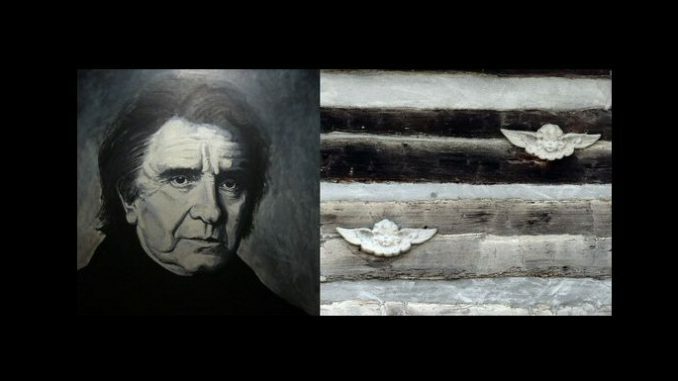 As many fans know Johnny Cash was a man of faith thus the holy books reflect an important part of his life. 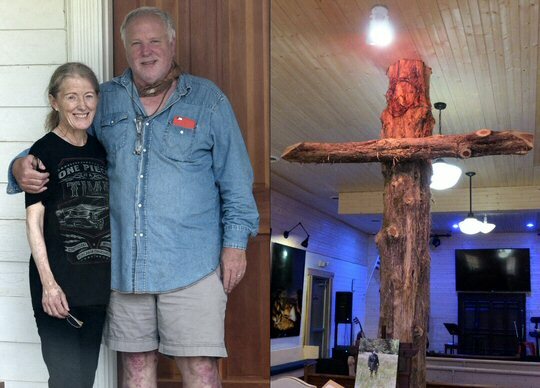 One of the most striking features in the main room of The Storytellers Museum is the central support beam in the shape of “The Old Rugged Cross” a hymn that Cash had covered. In addition to this dramatic testimony there are subtle details to look for in this welcoming place. Part of the admission ticket includes a short film about Bon Aqua that incorporates never-before-seen-footage from 1975 of Johnny with family and friends celebrating his 20 years in the music business. It is an intimate well-preserved video shot like a home movie by a professional. On the hour live music is presented on the “Little Stage”. On September 03, 2016 we had the pleasure of hearing Mark Allen Cash (Johnny’s nephew) perform. Mark shared some of his memories of his Uncle. 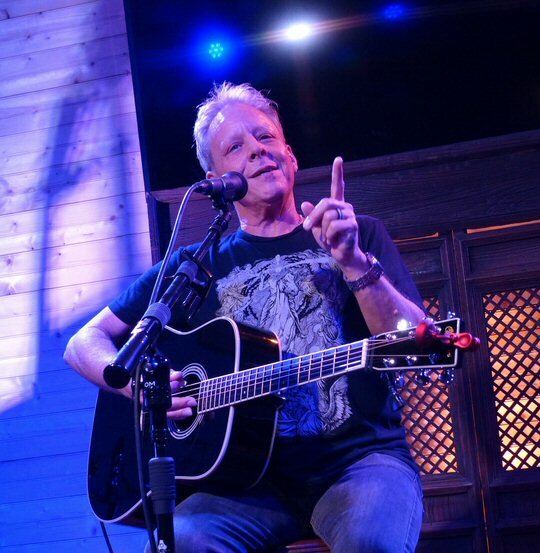 The highlight of his set included a number of covers such as “Sunday Morning Coming Down” and “Long Road Home” – a richly heartfelt song Mark penned inspired by Bon Aqua that is prominently featured in the opening documentary. Mark has a deep expressive voice and he is a fine storyteller. Dan Oxley another talented artist played a montage of music on a horn and wind instruments backed by piped in instrumentation and videos. Johnny’s nephew Mark Alan Cash is the museum’s featured performer. After a short drive from the general store we pulled up to wide open fields at the Johnny Cash Hideaway Farm also in Bon Aqua. We were greeted by Jo. She pointed out the tall magnolias and other trees in the front yard that had been planted by Johnny. Inside the home are some of Johnny’s personal effects including stacks of books. Jo who grew up in Hickman County recalled seeing Cash in town. She enthusiastically shared stores with us as did the Oxleys who were on site on Saturday. The painting that launched a restoration and unique Cash collection. Back at The Storytellers Museum the Oxleys have future plans to open a café and store to make the three corners at Highway 46 an active and vital hub for visitors to Bon Aqua. Their aim is to create a popular tourist attraction but maintain the small town feel that so appealed to Cash. On many a Saturday nights, The Museum will be hosting concerts just like Johnny did. The Storytellers Museum is currently open Wednesday through Saturday but please check their website for current information and Saturday night show times. Just as Bruce Springsteen has been instrumental in “The Rising” of Asbury Park, New Jersey the legend of Johnny Cash lives in Tennessee. He was a man larger than life that touched many yet was big enough to admit his mistakes. Johnny Cash is the timeless tale of redemption. Thus, The Storytellers Museum and The Farm at Bon Aqua holds important moments in music and spiritual history. History that you can touch and see for yourself now for the first time on your next pilgrimage to the heart of the Volunteer State. The Bon Aqua Hideaway Farm in Hickman County is now open to the public.